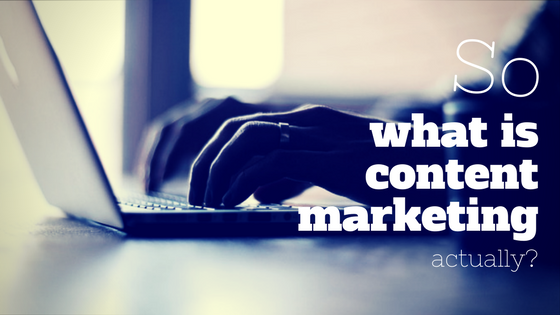 So what is Content Marketing, actually? You may have heard the phrase “content is king” before. Content creation has been both trending and dying since the onset of social media. When I joined the team at Break the Ice Media in 2011, generating marketing content was a hot topic. Soon after, the trend was said to be fading away. We were also supposed to lose Facebook. That was over six years ago and content marketing and social media have yet to fade even a little. They’re closely related and they aren’t going anywhere. So what is content marketing? What does it have to do with social media? And why won’t it go away? First, what is content marketing? To understand content marketing, we first need to define content. Content is consumable informational material. This blog is a piece of content. Articles, white papers, infographics, email newsletters, videos and slideshows are all examples of content. Books and ebooks are content. Marketing is how we promote a product or service. Content marketing is using informational materials to promote a product or service to the intended audiences. At its most basic level, the content educates the customer on the topic at hand, gives them confidence in the product or service as a thought leader and reputable organization to buy from. What does content marketing have to do with social media? Using content has always been part of marketing plans, and social media amplifies the need for content. As the internet grows and technology develops, we get more and more kinds of content and the content digs deeper. People share different opinions and levels of expertise on their industry topics. Before the digital age, content marketing was brochures, books, pamphlets, flyers and the like. With so many platforms and channels, content spreads easily and can even “go viral.” Social media is the ultimate delivery tool for content marketing. Instead of mailing postcards or pamphlets, a simple share button puts content in front of thousands of people at once. On the flip side, social media needs content to share in order to fill its feeds and engage followers – for both individuals and organizations. Why won’t content marketing go away? Simply put, content marketing won’t go away because it always has been, and always will be a big part of marketing. Consumers want to know more about what they’re buying. Whether it’s a product, a service or an idea. Now that we have the basics down, let’s dive a little deeper. Like, what makes a great piece of content? There is substance to it, and it provides value in some way to the target audience. The topic of the content is best for both marketer and consumer when it’s relevant. Talking about something off-topic does nothing to help a marketer promote their product or service. Off-topic content is not interesting to the consumer because they expect to see content that relates to the product or service in some way. One of the best ways to be valuable and relevant is to give your audience some new knowledge. Content marketing is a great way to demonstrate expertise rather than saying it over and over. Shorter, sales-focused messages purport your expertise, but longer form content gives you a chance to really show off. There’s a saying I’ve heard around B2B (business to business) marketing. When you’re marketing to a business, you’re still talking to people. It’s a good idea for all marketers to keep in mind. Content needs to be engaging and entertaining, no matter what you’re promoting. Check out our tips for writing for your business. Honestly, if you are a business, people know you are selling/promoting something. While it’s great to have a call-to-action, with content marketing the action is usually softer and leads the customer to more content or another way to engage with you. I love the 13th quote in the content marketing Linkedin roundup from Rebecca Lieb, Conglomotron LLC. She says “…it’s a pull strategy — it’s the marketing of attraction.” It’s a way of pulling the audience in with great information about your topic. Strategic content marketing is an integral piece to your overall marketing plan. Now that you know what content marketing is (chances are you were already doing it in some way), you can more effectively work it into your marketing plan. Do you have an overall strategic marketing plan? Is social media part of your plan?